Summer in Las Vegas is the easiest way to have an affordable vacation that also allows you to turn it off, reset your mind and go completely wild all in one trip. Pools by day, nightclubs by night and the best collection of restaurants and bars of any vacation spot on the globe. Try to match the options that Las Vegas gives you for fun and entertainment and you'll quickly find that it is just not possible. Don't fight it, just start planning your summer in Vegas! Summertime is synonymous with fun so the natural thing to do is find all the things to do in Las Vegas to have some fun. Why not a different thing everyday of the summer? Well, summer is not really 100 days long but the temperature by the Las Vegas pools suggests that it is, so we are going to celebrate with 100 days of fun in Las Vegas anyway! I broke these suggestions up by month for no other reason than to give you things to do all summer. By all means have a lot of fun all at once or spread out the entertainment all summer. If you are ready for it, so am I. Grab some SPF 30, some sunglasses and get ready for summer in Las Vegas. Do you have some of your own ideas? Find me on the social networks and let me know all about them. 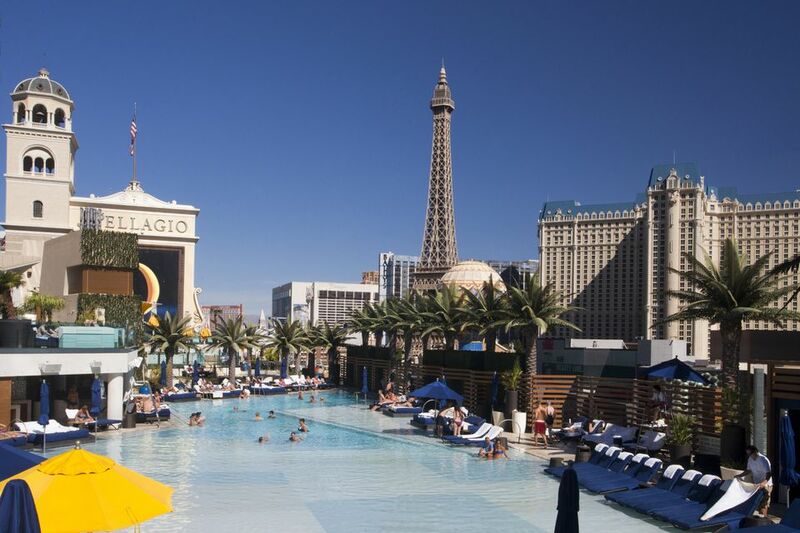 Find a Swimming Pool in Las Vegas - No brainer, right? Well not if you have kids or if you are avoiding kids. Do you want music with your swimming? How about a lazy river? Rest, Relax, Repeat at ARIA Las Vegas - I’m at ARIA for the food and the spa and the rooms. Oh, I also really need the pool and bars. Did I mention the shopping and the art? Find only the best of Las Vegas - When you only need the very best this is what you need. Take a day trip from Las Vegas - Fun does not have to stay in Las Vegas. Take a quick day trip for more summer fun in the great outdoors. The Mob Museum Las Vegas - You’ll be impressed by the amount of information that they have compiled bout the mob in the United States. Take the kids to see a show in Las Vegas - The kids need to be entertained so find them a show. Sample the Best Burgers in Las Vegas - There are so many good burgers in Las Vegas that you can try all of these and still need a few more. Cocktails at Hyde - Have a drink with a view and then dance until late in to the evening. Visit the Smith Center to UnVegas your Vegas Vacation - You’ll need to see a real show in Las Vegas at the Smith Center. See a Shark on the Las Vegas Strip - Shrak Reef is the real deal at Mandalay Bay. Touch a sting ray or sit and watch the sharks swim over the top of you. Spend an afternoon with Mac King - Best show in Las Vegas! Yes, it is that good. Sink Your Toes Into The Sand at Mandalay Bay Pool - Catch a wave or float in the lazy river or just dip your toes deep in to the sand. The Must See Las Vegas Shows - These are the popular shows that everyone wants to see. So see one. Stay Out Late At Cosmopolitan Hotel - The nightclub is hot, the restaurants are among the best and the bars will tempt you to stay up very late. Find The Best Restaurants in Las Vegas - If you love to eat you’ll have plenty of fun in Las Vegas eating with some of the best chefs in the world. The Neon Museum in Las Vegas - Take a walk around the neon boneyard and see the history of Las Vegas through the pieces of once forgotten signs. Explore the Grand Canyon From Las Vegas - The Grand Canyon is a few hours away and it is the kind of place you’ll never forget. It is hard to imagine a place that is so vast, huge, deep and impressive. Yoga with Dolphins - Find your relaxation with a yoga practice while watching the dolphins swim by you. Kids in Las Vegas? It's Cheap, Why Not? - Yes, you can take your kids Las Vegas and it does not have to be expensive. Art In a Garage at Cosmopolitan - Go ahead and take a walk around the parking garage and see some real street art at the Cosmopolitan. Find a party in Las Vegas - It’s not hard to find a party in Las Vegas but this should help you narrow down your choices. Be Bad In Las Vegas - Do you want to guarantee yourself a bad time in Las Vegas? Good, I can help. Fly through the air "Top Gun" style - Sky Combat Ace will not only get you into an airplane they’ll get you to fly it, flip it and tumble it. This is a must do in Las Vegas. Indulge in Luxury at Palazzo Hotel - Take a day and just experience the very best that Las Vegas has to offer. I prefer Carnevino for dinner, Canyon Ranch Spa for some relaxation and TAO for some dancing. See The Beatles Love by Cirque Du Soliel in Las Vegas - You don’t have to like the Beatles to love Love. Drive a NASCAR at top speed - This is not just driving a race car this is the total experience. Hit the gas and go at the Las Vegas Motor Speedway. Taste Pizza Perfection at D.O.C.G. - The best pizza in Las Vegas. Period. I’m never wrong, really, ask my wife. Get Some Sun at ARIA Las Vegas Pool - Have a drink and sink into the shallow end of the pool. Your summer fun should include a pool and Aria has the right combination of fun and sun. Experience Gordon Ramsay Steak - You’ll be drawn to the cocktail menu and steaks but I’ll tell you that the Fish and Chips are way more fun this summer. Day trip to Zion National Park - Get in the car and see Zion National Park. It’s a couple of hours away but the views of the canyon and the sandstone cliffs are worth the effort. Wynn Golf Course Las Vegas - The course is expensive but it is a tiny taste of the good life and after you have a little you’ll want a lot more. The course is challenging so don’t bring that game you have been using at your local muni, bring the “A” game. See the strip from a helicopter - Soar over the top of the Las Vegas strip and grab a few pictures for your Facebook profile picture. This is summer fun from way up in the sky. Live it up at Bellagio Las Vegas - The restaurants are among the best and the bars make me want to quit my job and learn to craft a cocktail. The pool is luxurious and the place just makes you feel good. Late afternoon hike in Red Rock Canyon - The mid day hike in the summer is not going to happen, it’s just too hot. The late afternoon hike though, is still a possibility. Take water because it is still pretty hot. See the Free Circus Acts at Circus Circus - No matter how many times I see the free circus I always stick around for the second show.. It’s compelling and it is free. Paint with dolphins at the Mirage - You get to interact with a dolphin and see all the behind the scenes good stuff. You get a piece of art as well but the pictures of you and a dolphin will really impress your coworkers. Get some sun at Parasol Down at Wynn - I always send people to Parasol Down at Wynn for a drink. Why? I love the outdoor patio and what is wrong with a few stiff cocktails in the middle of the afternoon? Dance until dawn at Marquee Nightclub - You’ll dance. You’ll meet someone. You might even remember their name in the morning. You’ll do it all over again the next day. You’ll be so happy about it on the way home. Have an incredible Hemingway Daiquiri - Need a classic cocktail? This is my idea of fun in Las Vegas. Papa would have approved of this cocktail and these bars. Mesa Verde From Las Vegas - This is a bit of a drive but Mesa Verde National ark is very impressive so get in the car and go see some cliff dwellings. Paiute Golf Course Las Vegas - Yes, it is hot in the middle of summer but if you hydrate and …, nope it’s hot. However, get on the golf course and ignore the heat and take advantage of the wide open fairways and lack of crowds. When in Rome Do it Like Caesar - Spend sometime at the Garden of the Gods at Caesars Palace and then eat at one of the bazillion restaurants they have and then make sure you visit Qua Spa. An afternoon on the patio at Carlos' N Charlies - Giant margarita’s and plenty of chips and salsa to keep you dancing with complete strangers to music that was in 30 years ago. You will have a blast. Dive with sharks in Las Vegas - Yes, you can dive with the sharks. You have to be staying at Mandalay Bay and you have to be SCUBA certified. Listen to me when I tell you that it is one of those things that has to be on your bucket list. Dance along with the Blue Man Group - High energy show with a crowd that really wants to have fun is the perfect recipe for an unforgettable show. Get there early because the entertainment before the show starts is just as good as the show itself. Take a Pink Jeep Tour - Jump into a truck that is not really a jeep and see the sights in Las Vegas. It’s not off roading and in fact it more of a luxury tour but that is a good way to have some fun in Las Vegas. Try the best burger in the world - The burger at L’Atelier de Joel Robuchon is the best thing you can ever consider putting in to your mouth. You must have this and it is well worth the price. Infuse your cocktail at Palazzo - Fusion at Mixology is the place that will have you experimenting with infused alcohol the minute you get home from your vacation. Get a Spa Treatment at Encore Las Vegas - Everybody needs a massage some people just don’t know it. Encore Spa has a few treatments that I know I need on a regular basis. Head To Bryce Canyon From Las Vegas - This is a bit of a drive from the Las Vegas strip but I can guarantee you that you’ll be impressed by the colors of the sandstone and the steep walls of the canyons. Sandy Beach Time at Mandalay Bay Las Vegas - Feet in the sand, drink in the hand and nothing better to do than waste an entire day at the pool in Las Vegas. Drive an exotic car very fast at the Las Vegas motor speedway. Fast is such a relative term when you think about what it means to hit a corner in an exotic car at 70mph. All of sudden you accelerate out of the turn and you see the car get to over 100mph. That’s fast. Bali Hai Golf Course Las Vegas - gold wit ha view of the Las Vegas strip. Yes, t will be hot out there but just be sure to stay hydrated and you’ll be fine. Ride a motorcycle in the Grand Canyon - Hug the turns and keep your eye on the road. The views are spectacular and the wind rushing past your face makes this so much fun. Jump off the Stratosphere Tower - You step to the edge and jump. This is fun from a scary altitude. This summer face your fears and jump. Juggle and laugh with Jeff Civillico - This is one of those shows that you’ll enjoy way more than you thought you could. The guy is likeable and the crowd will be engaged as you laugh a bit too much. Touch the Titanic - Real artifacts from the Titanic. How cool is that? Walk though and find out all the little details that you ever knew about this giant ship. Try your CSI Skills in Las Vegas - Solve a crime and learn a little science in the process. See the Four Corners from Las Vegas - The wide open spaces of the Southwestern United States are so close to Las Vegas that I always tell people about them. Spend a day in the part of the country and you’ll be drawn back over and over. It is so impressive in person. Stand under a few million dollars of glass - Located in the lobby of Bellagio Las Vegas gaze at the artwork above your head. When you are done walk over to the gardens and you get two free attractions in one day. Find the Pub and The Lazy River at Monte Carlo Resort - If you are traveling with the family you’ll spend more time at the pool and less at the pub but if the kids are home you really need to head in and try at least 5 of their 300+ selections. Experience Encore Beach Club - This is what a fancy Las Vegas pool looks like. Adult fun taken to a new level. See some entertaining puppets - Terry Fator is so talented you almost forget that the puppets don’t really exist without him. They are far too realistic and they have a tendency to freak me out because ethey are so good. Lounge at LAVO - Find a spot outside and enjoy an evening with a Las Vegas nightclub twist added in to it. Head to the top of the Eiffel Tower - It’s a little romance and a little thrill seeker mixed together. The views of the Las Vegas valley are very impressive. Vodka Cocktails and an extra drink at the ice bar - I’m enjoying the food at Red Square lately but I have always loved the bar and the cocktails that come from the large selection of vodka that they have. Cigar and Mojito. Any Questions? 8 Month Dry Aged Steak? Does summer really end in Las Vegas? Well, it can be warm in October but by Halloween there are more and more days that are cooler and tempt you to stay in the casino. Yes, there are heated pools but you need the heat of a Las Vegas club instead.